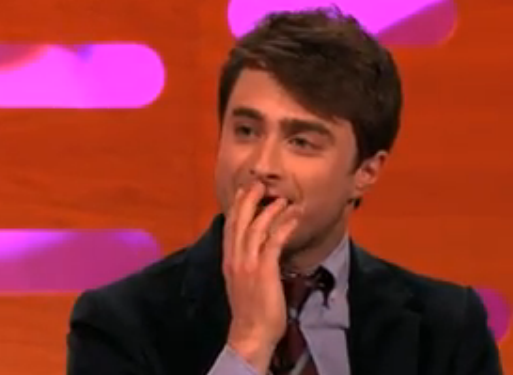 Daniel Radcliffe recently appeared on The Graham Norton Show. During his interview Radcliffe described a scenario wherein a woman had propositioned him via a letter in advance of a particular performance of Equus - and even gave her seat and row number to him. When Graham Norton asked, "But did you see her? You must have checked her out." - the actor denied it. However the man formerly known as Harry Potter told a lie. Norton even called him out on this deception. This video provides some excellent nonverbal examples of lying (and many other emotions) - can you spot them all? Daniel Radcliffe immediately covers his mouth as he says, "I didn't know, you know what, I really, I, I, I did honestly, I, I didn't look. I didn't see her, I don't know what, I don't know what, I didn't, I didn't see her ...."
"The gentleman doth protests too much methinks." Covering the mouth with even just a finger, let alone several fingers in the context of a verbal denial is highly indicative of deception. A slight smile (duping delight) can also be visualized through his fingers - although this is better seen in the dynamics of the video as well as an image captured a few seconds later and shown below. 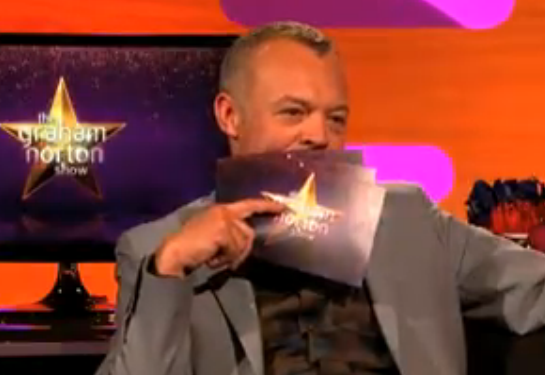 Here Graham Norton exhibits mirroring of Radcliffe's mouth covering - by covering his own mouth as well (the cards act as a hand surrogate) - as he says, "Daniel's Lying!" The "Hand Chop" hand gesture (Illustrator) in the midst of verbal denial (at the very end of the video) - is yet another strong indicator of deception. Radcliffe does this multiple times. This image captured at 2:29 shows another example of "Duping Delight" smile suppression. To fully appreciate this, the video must be viewed. Duping delight in the the midst of verbal denial is also highly consistent with lying. This nonverbal is not directly correlative with deception - but it is very telling. 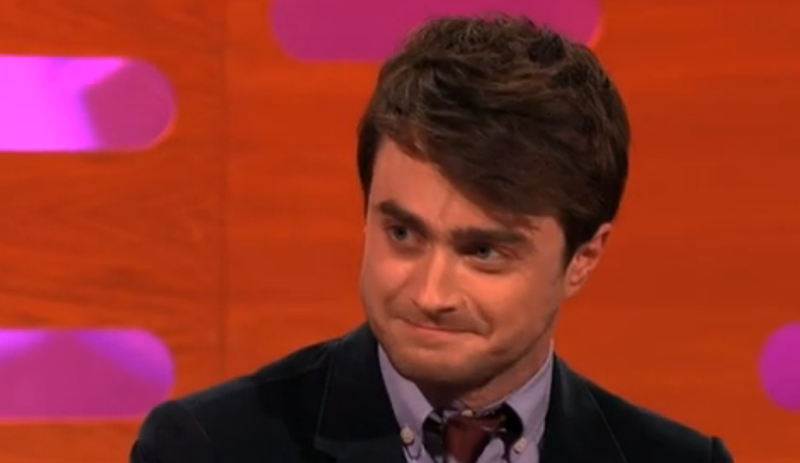 This is just at the moment when Radcliffe tells everyone he was living with his parents. As he does this he reaches with his left hand beneath his right thigh (1:53). This is indicative of anxiety and specifically it's a beta/low confidence behavior. Daniel is somewhat embarrassed by living with Mum and Dad. This momentary yet demure emotional mindset is further exemplified by the slight turning-inward of Radcliffe's knees. Here Daniel displays a shirt cuff adjustment (2:15). This is an indicator of anxiety- and specifically it signals a "dialing up of alpha emotional mindset". Radcliffe's psyche is trying to be more assertive and confident after the more beta display seen above (1:53). Such interviews are full of body language displays. What other ones did you see? How many will go unnoticed in your next meeting? What other signals of deception are present here?